Whether you are planning a weekend camping trip or a week long trip, choose to camp with this travel trailer! 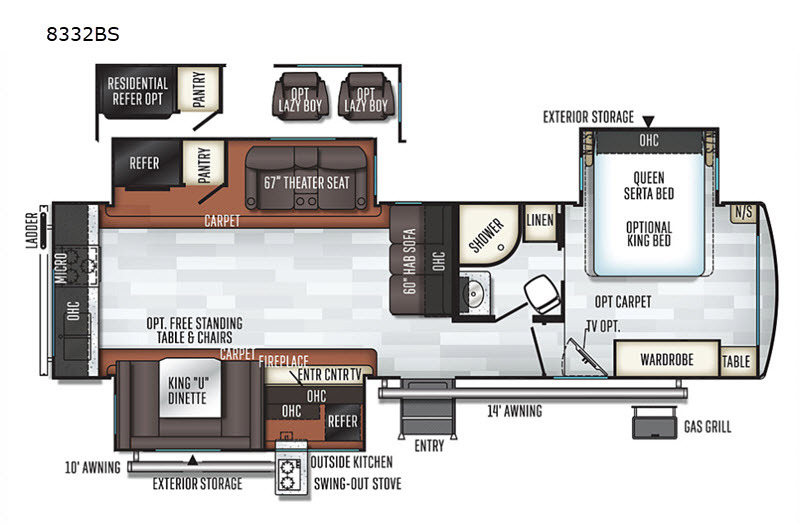 With three slide outs, your family of six will enjoy all the extra interior space. In the rear you will find a kitchen area with the amenities along the rear wall. Within the curbside slide out there is a king "u" dinette where you can dine during the day, and at night easily convert this area into additional sleeping space. On those chilly evenings plan to enjoy a fire in the fireplace or watch a movie on the LCD TV. When you are ready to turn in for the night, the front bedroom includes a Serta queen bed or you can choose an optional king bed. 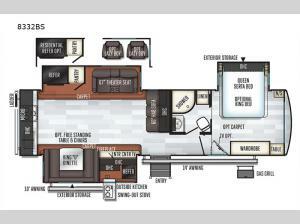 The bedroom also features a wardrobe and you even have the option to add a TV. For the chef in the family the exterior kitchen will be a draw! Here there is a refrigerator, a two burner swing-out stove, plus an outdoor gas grill.